Image 1 of 43. Click to view fullscreen. Luxury Penthouse with rooftop pool, stunning sea views, 5 min stroll to town. 'Topaz' is perfectly located just a 5 min flat stroll to the Old Town of Kalkan. Offering a discount for bookings of 2 people, stylish 'Topaz' is a stunning, hi-spec Penthouse with a gorgeous private terrace and very own rooftop pool for your sole use. 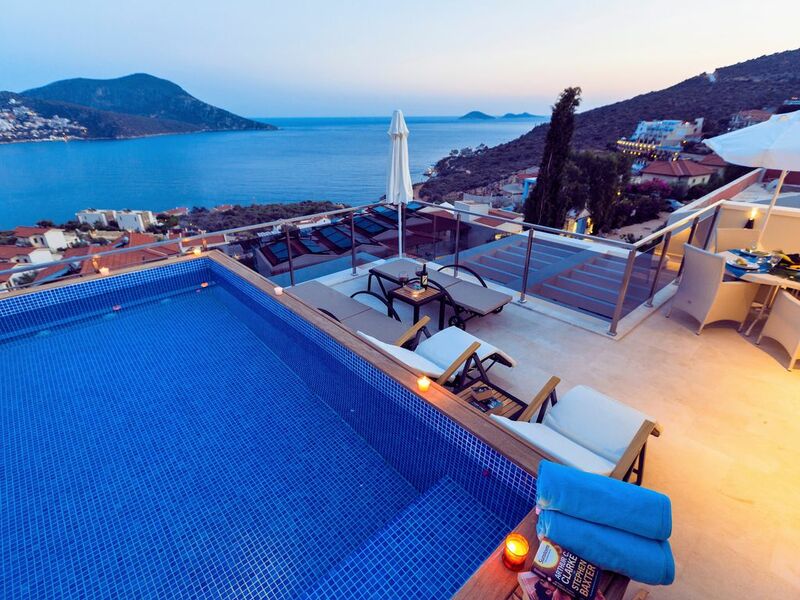 It boasts the most amazing sea-views and probably the best location in Kalkan! Peaceful and private and yet just a gentle 5 minute stroll to the heart of the Old Town, Harbour and beach. The Penthouse is perfect for couples looking for something a little bit special! Please get in touch to obtain a quote specific to your requirements. There are 2 gorgeous bedrooms, each with en-suite bathroom, a private rooftop pool and spacious sun terrace. You can rest assured that peace and privacy reigns as the gorgeous pool and sun terrace are exclusively for your sole use. Boasting the most prestigious address in Kalkan and an enviable central location, less than a 5 minute, flat stroll to the Old Town, Penthouse Topaz is not to be missed. Stylish, high-spec accommodation in a central location with fantastic restaurants, bars and shops just a gentle stroll from your door. This beautiful duplex offers the most amazing sea views from every window. The modern, open-plan living area opens out to the spacious rooftop terrace with its own private pool and panoramic views across the bay to Snake and Mouse Islands. The Penthouse is equipped with all mod-cons including a Nespresso Coffee Machine and a water dispenser/cooler, Wi-Fi and Satellite TV. Perfectly situated in the exclusive Lykia Estate area, just off the Kalamar Road, it is just a gentle 5 minute flat stroll from the Old Town. This much sought after location offers the best of both worlds, a tranquil haven to get away from it all, yet just a stroll from the atmospheric Old Town and Harbour with its mouth-watering array of restaurants, shops and bars. With everything on your doorstep taxis are not required, a definite bonus for those who like the freedom and ease of getting around on foot. Due to the design and layout we do not accept guests under the age of 18 years. Mavi Su House is an exclusive residence of just 4 duplex properties each with its own private pool. Penthouse 'Topaz' occupies the top 2 floors and therefore boasts some of the best views in Kalkan! Proceeds from bookings are used to keep the apartment in tip-top condition for all our guests to enjoy time and time again. Our Kalkan based management team will be on hand throughout your stay should you need any assistance. We are happy to arrange your airport transfers to get you from and to Dalaman airport with ease. There will be a handy Welcome Pack provided containing the essentials for your arrival. Getting away from it all is something my husband and I look to do whenever we have the opportunity! Time to escape the hectic work schedules & the UK weather and fly away to the sunshine! We love having fabulous restaurants on the doorstep, being able to enjoy mouth-watering food and wine in a friendly atmosphere, all within a gentle stroll of the house is perfect! Wandering the quaint cobbled streets of the beautiful Old Town and spending lazy days on the sun-terrace enjoying the fabulous views are our other favourite pastimes! Keeping the apartment in tip-top condition for all our guests to enjoy is our priority. I can therefore confidently recommend this stunning penthouse to those who wish to holiday in comfort and style with all amenities within walking distance. Car or taxi's not required. Stylish 'Topaz' at Mavi Su House is a gorgeous Penthouse with private rooftop pool, spacious sun terrace and stunning sea views. It is perfectly located just a gentle few minutes stroll from the heart of the Old Town with its delightful array of restaurants, bars and shops. You will be hard pushed to find a better location in Kalkan! We are proud to boast a high number or our guests return year after year, this is testament to the service provided to our guests by our professional management team who will do their very best to ensure your stay is as enjoyable as possible and will be on hand throughout your stay should you need any assistance. Kalkan is an upmarket resort on Turkey's gorgeous Turquoise Coast with beautiful beaches, an atmospheric Old Town and picturesque harbour. The Old Town comes alive in the evenings with a fantastic array of high quality restaurants, shops, cafes and cocktail bars. Penthouse 'Topaz' offers its guests the space and privacy to relax in luxurious surroundings yet is just a short stroll to the lively Old Town, Harbour & Beach. We do not like to drive or take taxi's when we are on holiday so having everything within walking distance is essential. The Penthouse is perfect for couples or friends travelling together and benefits from well lit, flat road leading directly to/from the Old Town which means getting around on foot is easy. We chose this stunning Penthouse as we believe it has everything to make the perfect holiday home; Location, Location, Location! All amenities can be reached on foot, it has the most amazing sea views and provides a romantic and peaceful haven to get away from it all. 'Topaz' has a contemporary, modern feel, with stylish furnishings and cool decor to suit the most discerning guests. The gorgeous rooftop pool along with the sunbathing and dining terrace is the perfect place to spend lazy days relaxing in the sun, then as evening falls, wander in to the atmospheric Old Town to enjoy dinner at one of the many restaurants. Perhaps most crucially, Topaz is less than a 5 minute flat walk in to the Old Town. To be able to stroll out for dinner, to the shops or to the beach and return without the need for a taxi is bliss! This spacious duplex is arranged over 2 floors and sleeps up to 4 people, however we actively encourage bookings of just 2 people or solo travellers. Please get in touch and we will provide a tailored quote specific to your requirements. Please note, due to the design and layout of the Penthouse, we do not accept guests under the age of 18 years of age. toilet, shower, En-suite to bedroom 2. Towels and Bathrobe provided. All towels, including beach towels, are provided along with Bathrobes for a touch of luxury! All linens and towels are provided. Our maids will change the bed linen and leave fresh towels every few days. Bathrobes are also provided for use during your stay. You can park directly outside the property. Our housekeeping team will provide fresh towels every few days and will also clean the bathrooms and kitchen. Bathrobes are also provided for use during your stay. There is a Nespresso Coffee for those who love great coffee! A Welcome Pack will be provided for your arrival containing the essentials such as water, milk, tea, coffee, orange juice, bread and eggs. Fully equipped to prepare anything from a quick snack through to a full meal. There is an outdoor dining table on the terrace to make the most of the al-fresco dining experience. There is also a dining island/breakfast bar in the kitchen area. Satellite TV with English channels. Satelite TV with English channels - includes BBC News. Both bedrooms have a private balcony furnished with table and chairs or make the most of the amazing sea views. The spacious and private terrace offers the most amazing sea views. Furnished with sun loungers, a dining table and reclining chairs. A sail-shades provide a break from the sun when required. The penthouse is perfect for couples. Romantic and private yet just a gentle stroll to the heart of the old town. Topaz has a gorgeous, private rooftop pool! It is the perfect place to cool off and enjoy the breathtaking sea views and amazing sunsets. Ensuring our guests have the most enjoyable stay is important to us, therefore our apartment manager is contactable 24 hours a day should you need any assistance. The apartment will be fully cleaned and prepared for your arrival and we will provide a complimentary Welcome Pack containing the essentials to keep you going until you can get to the supermarket. There is a handy supermarket literally 2 minutes walk from the house where you can buy most things you may need. Topaz is perfect for couples, solo travellers or friends requiring 2 bedrooms, conveniently located just a stroll from the Old Town and Harbour. There is plenty of private outdoor space to relax and make the most of the long sunny days, warm evenings and amazing views! Enjoy a dip in the gorgeous pool and soak up the sun by day then wander in to the town in the evening!. We are happy to provide an under-occupancy discount for bookings of 2 people. Everything you could wish for in Topaz, stunning views & easy walking to town. The layout of the apartment & how it is presented is 5 stars. We would highly recommend & will certainly book again. Apartment and facilities are of the highest standard. Views from the pool and terrace are superb. Location is excellent, within easy walking distance of the town and located just over the road from a hotel offering a beautiful sea view bar and restaurant. Thanks Jo, we are hoping to return soon. We have been to Kalkan many times and this is the best apartment we have stayed the location, views and the management team are all superb. Jo the owner is great to deal with and very helpful . Fingers crossed we hope to stay here again many times in the future. Stunning apartment, lovely sea views, walking distance of the old town restaurants and bars. Perfect from start to finish. Stunning Penthouse in fantastic location! Penthouse Topaz really is impressive in terms of location and facilities. It was perfect for my husband and I. Gorgeous terrace with excellent views. Excellent maid service kept the apartment spotless, and Tekin, lovely guy, looks after the outside areas and cannot do enough for you. We will be back! My partner and I booked Penthouse Topaz for our honeymoon. It was perfect - the spec is really high such as the fully equiped kitchen, walk in showers, air conditioning and comfortable beds. That's just the inside - outside is the 'plunge pool' and the most breathtaking view you'll never get tired off. Kalkan town is 5-10 minute walk, and the harbour/restaurants are down a steep hill it must be noted, but there were plenty of taxis if you didn't fancy the hike back up. The town has frankly the best food we've ever had, and so much choice at such great value. Our favourites were steak from Alternatif and calamari from Sea Port. We only stayed a week, but had midweek cleaners which was nice. We'd really recommend spending the little extra for this penthouse, you won't regret! P.S. The owner Joanne is really friendly too and quick at responding to emails. Penthouse Topaz at Mavi Su House is perfectly located just a short stroll from the Old Town, adjacent to the Asfiya Sea View Hotel. To pin point the exact location go to Google Maps and search 'Villa Mavisu Kalkan'. Penthouse Topaz is the perfect place to enjoy a relaxing holiday in beautiful surroundings. With picture perfect sea views and the gorgeous Old Town on your doorstep this stylish Penthouse with its own private roof-top pool and spacious sun terrace is in a class of its own! Kalkan is a real foodies destination, with approximately 200 high quality restaurants within a 5 minute walk of the house! Many of the restaurants offer romantic rooftop dining for which Kalkan has become famous. The atmospheric Old Town has a magical feel as you wander the cobbled streets, enjoy a refreshing cocktail and a delicious meal knowing you are just a short stroll from home! Kalkan is located on the South-West Mediterranean Coast and forms part of the ancient 'Lycian Way'. As such, there are many important historical sites dating back to Persian, Roman & Ottoman rule. These include, Xanthos, Letoon. Tlos & Kekova - also known as the Sunken City, some of which have been granted UNESCO World Heritage Status. Kalkan provides the perfect base from which to explore the rich culture and colourful history of this ancient land. Day trips are highly recommended & can be arranged locally. There is a lovely pebble beach in Kalkan with the most beautiful turquoise sea. There are also luxury Beach Clubs dotted around the picture perfect bay, perfect for those wishing to relax, soak up the sun & cool off with a dip in the crystal-clear sea. The Yali and Indigo Beach Clubs, considered to be the best in Kalkan, are just a 5 minute walk from the house. A boat trip to admire the stunning coastline, beautiful coves & swim with the giant turtles is a must! The gorgeous Gulet boats leave from the nearby harbour each morning. There is a good choice of flights to Dalaman from the UK on most days of the week. Once at Dalaman, we can arrange a private transfer to take you directly to the apartment. Our Kalkan based management team will be on hand throughout your stay should you need any assistance. When you arrive at the apartment there will be Welcome Pack containing the essentials to keep you going until you can get to the local supermarket. Just a gentle few minutes' stroll from the apartment, along one of the most exclusive roads in Kalkan and you will be in the centre of the Old town! Here you will find a mouth-watering array of restaurants, amazing shops, plus the beautiful harbour with its fine selection of waterfront restaurants and bars. 'Zenato' at Mavi Su House is perfectly located in the exclusive Lykia Estate area, being one of the original residences it managed to secure the best location, close to the sea and just a stroll from the Old Town. Properties on this exclusive road are much sought after as they enjoy the best of both worlds - the ease and convenience of being able to walk on the flat to the old town and an exclusive and tranquil setting, not to mention some of the best sea views in Kalkan! Being central to all amenities yet providing a peaceful haven to get away from it all, ensures our guests can experience the best of Kalkan without the need for taxis or a car. It is a just a few minutes walk to supermarkets, banks, chemists, shops, cafes and restaurants. The closest supermarket is just a 3 minute walk from the house. We are happy to offer a discount for bookings of 2 people, please get in touch to obtain a quote. Stunning 'Topaz' at Mavi Su House is a luxury Penthouse offering amazing sea-views, large terrace and romantic roof-top pool. The Penthouse is perfect for couples seeking something a little bit special - stylish, high spec accommodation, just a short stroll from the enticing array of restaurants, bars and shops of the gorgeous Old Town. Boasting an enviable front-line position, amazing sea views and spacious sun-terrace, everything beautiful Kalkan has to offer is on your doorstep! Please note, children are not permitted at this property. Our Kalkan based management team, led by Gonca of Kalkan Exclusive Properties, will ensure the apartment is fully prepared for your arrival and will provide a handy Welcome Pack containing the essentials. The team will be on hand throughout your stay should you need any assistance. We are happy to arrange your Airport Transfers, please request on booking.